Love the show but can you guys get the days fixed please? The current podcast is always listed as the day before. Chill Skip! What can go wrong with the Cowboys, will go wrong! I love the podcast, one of the best out there but, guys come on, you gotta talk about other stuff than Lebron and KD or Tom Brady. It’s just constant. And another thing, athletes continue to get bigger, stronger and faster. We have to stop comparing players from the 70s and 80s to athletes today. Apples and orange and I am 100% game to debate this. Shannon is the goat. If it weren’t for him there would be no show. Skip needs to retire I’m tired of hearing his BS lebron James hater. I cannot get any podcast since March 23, 2019. Someone needs to address this. I don't know what happened, but since 3/22/19, I can't play any episodes. Error message " temporary unavailable " generates. But it is a good show. Shannon makes this show go only reason i tune in i cant stand to hear be on the show with rob parker and chris broussard shannon sharpe makes this show funny and keeps skimp bayless in his place lol!! I love this show but I keep getting a popup saying it is unavailable when I try to listen to it. Help please! As of Mar 25 2019 the shows have been saying unavailable on the app. What is going on and who’s at fault here? Apple Podcast? Or Spotify? Undisputed is great show. The show is thought provoking and entertaining. I love Shannon’s take on topics, and the humor that he brings to the show. For example putting on the Goat mask or the accessories that Shannon brings on the show. He also allows for the viewers to hear a perspective from a Hall of Famer. Especially when the topics are on football. Skip brings the facts and is always prepared to debate. The chemistry between Skip and Shannon is awesome. I like how they feed off one another. They are unafraid to tackle topics and voice their opinions. My only gripe is Shannon’s over the top love affair with LeBron James. Every episode does not have to include a debate on Jordan vs. LeBron. It goes from being objective to subjective. Other than that, the show is great. I highly recommend listening to the podcast. I love this show! Skip and Shannon both do a great job as well as Jenny! Love the show. Only listen for Shannon and Jenny and the guests. Fanboyism makes bad sports talk! Skips drooling over “His teams” is annoying and unprofessional. You expect this idolatry from local sports talk but Skip taking his biased fanboy hyperbole on a national level is truly disgusting. Love Shannon though because he is entertaining and informative. I love the show but get it feels stale when literally episode has a topic on Lebron, Tom Brady, The Cowboys, Michael Jordan, or Colin Kaepernick (not as much now though). There is so much to talk about sports wise and Skip and Shannon just stay on the same topics. Throw some other stuff in. They’re all great and influential athletes but every single episode having to mention one of them seems excessive. The Cowboys are the most important team in sports. Most Underrated Sports/etc. Show. 💯 Salute! Respect! They debate if Jordan is better then Lebron EVERYDAY for about 50 minutes. Increasingly predictable. Skip, get over your hard on for Jordan. Fox needs to get their money back from Skip. The only reason I listen to this podcast is because of Shannon Sharpe. Shannon Was a professional athlete and can give you invaluable information that Skip cannot. Show is TRASH without Shannon... where’s UNC?! Tired of listening to Opinions, Cowboys and the general stupidity of shrimp balless, jEnNY and rob parker. The show is good. Shay Sharpe makes the show good. The problem is the show covers the same few topics everyday. Tom Brady, Lebron James, and Dallas Cowboys. Had to stop watching/listening. This show just recycles the same topics day after day. Usual order Cowboys, Brady, Dak’s grade from previous game, back to Cowboys, Lebron and then repeat with guests. The topics very rarely change from the above. Typically Mon-Wed is having the same discussion about the previous Cowboy game and Thurs-Fri is ‘Skip reveals who he is rooting for in the weekends Cowboy and Patriots game’ shock horror, he chooses Cowboys and Brady. Show is now unwatchable, very poor material. A waste of what started as a promising show. For the love of God, is there anything else that you could talk about?!? This is my favorite sports show easily. These two go well together. Skip can be a little much at times. Just gotta take the bad with the good. His good def outweighs the bad. I have listened to them almost everyday for a year now. So I feel pretty darn comfortable when I say these things. Both are very knowledgeable and always make good points, even if I dont agree they still drop good points. Sometimes they straight change how I think, and see stuff in not only sports. I could say they help me in life also like Sharpes old school quotes, I like repeat them in my head when I am in situations. Ol Shannon can see through anybody for real, its pretty cool to listen to. I havent had much chance to watch them cause I be working. But I bump their podcast errrday. Keep up the great work Skip and Shannon. Thankyou. Great show enjoy Skip and Shannon's back and forth. Awesome show keep it up! Its very entertaining. These guys keep it 100, but they are sometimes bias. The main thing is Lebron and Cowboy talk, but as long as Skip is defending brady, I definitely recommend you listen! 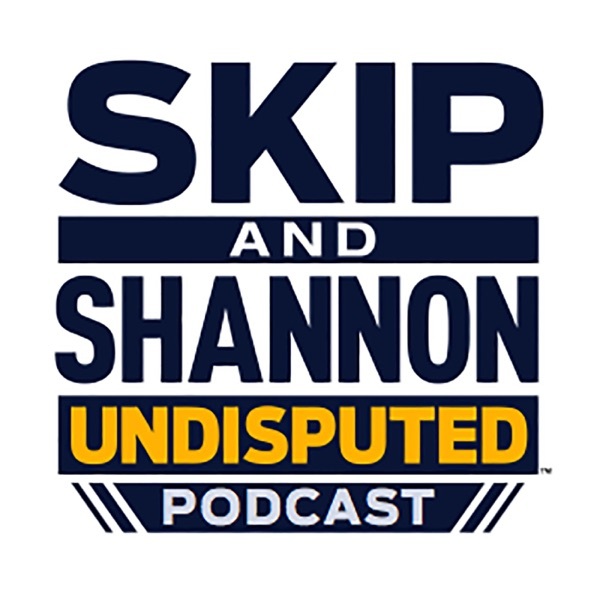 Been a long time since I listened to Skip though I do like his points - and really enjoy listening to Shannon’s take as well. There is only one huge problem: when the others are talking Skip “hmmm “, “ahhhh”, “ohhhhh’s, in a completely irritating and dismissive way constantly. It’s both condescending and reminiscent of a child interrupting ala “nana boo boo”. Yet nobody does this when he’s speaking. I subscribed for two shows, noticed this is the norm and took it off. Shame too because it could be a daily listen for me, but instead is headache-inducing. Everything from Jenny, Skip and Shan Sharpe. I only use to catch the snip it’s from Skip and Shans IG accounts. But I discovered this amazing thing called Podcasts. 👏🏻👏🏻 Bravo! Keep on keeping on. Every day at work, I listen to the day before episode in my truck. He is tough to listen to, but Shannon is a big step up from Steven Assmith. that boy sharpe tho Fresh off the jet sharper than Gillette .. And yooo skip “MY cowboys” Bayless how bout dem cowboys !! Skip and Shannon basically only talk about Lebron and the Cowboys. Camp be entertaining at times but at this point I’m extremely bored with the lack of diverse content. I really like this show and I like the way skip and Shannon’s energy combined but I really wish I didn’t hear about the cowboys and Lebron or Tom Brady vs Aaron Rodgers every time I turn this show on. This is the same show everyday. They talk about the same teams and the same problems. Talk about the Pats and cowboys just a little bit more!! We don’t get enough of it!! I LOVE The show ! Love the back and forth agreements and debates but Skip makes a lot of unfair Criticism of People (Lebron , Rodgers etc.) wish he would be just as fair as Shannon is . But Shannon be busting skip up anyway so I guess it evens out 🤷🏽‍♂️ Love you guys ! Skip is crazy, but Shannon is so bombastic that Skip almost seems sane by comparison. It’s definitely not the same as First Take, but it’s better than that show without Skip.